Waterfall Villas, one of the very few retreat centers in the world that has Private Waterfalls, is a Romantic Boutique Wellness Retreat and Spa.According to Trip Advisor, this is the BEST Bed and Breakfast / Inn for the Southern Pacific of Costa Rica. Located just 2.5 miles from the Dominical Beach, this exclusive retreat center has private wildlife reserve. This is just a heavenly place for all types of food lovers including Vegetarians and Vegans . The Waterfall Villas, a place of distinction, a space for relaxation, an escape from the hectic life, is one of the most absolutely luxurious and eco-friendly green lodgings in Costa Rica. This is the perfect destination for Honeymoon in Costa Rica, family reunion, Waterfall Wedding Ceremonies, Shamanic Spiritual Ceremonies and Waterfall Shamanic blessing. Looking for suites with luxury queen size Bamboo bed? Zen bathroom? Extra large balcony for viewing wildlife and the falls? 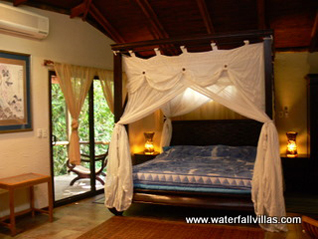 If so, Dragonfly Canopy Villa is waiting for you. It will ensure your privacy and comfort. If you are a fan of Goddess tradition, you will definitely like this one. It has two queen size Bamboo beds, 2 exclusive private baths. Private rainforest having Goddess statues has made Jade Spa Villa more attractive. To ensure total mind-body alignment, they have own private spa treatment area. There are two different suites each having king size Teak beds and two extra large luxury private bathrooms. In the Honeymoon Suite, there is an excellent carving of Sarasvati in white Balinese limestone. On the other hand,you will enjoy large marble wet bar, minibar and canopied bed. Kundalini yoga, the mother of all yogas and the most powerful yoga known, is a physical, mental and spiritual discipline for developing strength, awareness, character, and consciousness. 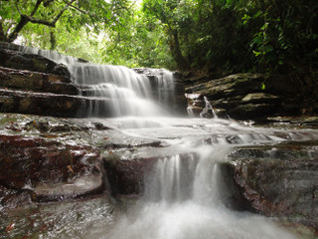 Waterfall Villas is one of the very few places where you will find a Kundalini Yoga session. The teachings of Yogi Bhajan will enrich your very inner-self. Detox yoga is a series of yoga sessions instructed by Fateh Kaur, one of the best yoga guru who has gained transmission directly from Yogi Bhajan. This unique method is designed to help you get mind-body alignment called Prana and Apana balance. Detox yoga helps to get access the unlimited life energy. It speeds up the elimination process of toxins. *Rates are subject to change anytime.